In December 2015 we will get the first 4K "UHD Discs". So please make sure we have this Mediatype in the Profiler by then. UHD Disc is a new Media Type like DVD, Blu-ray and now UHD Disc. Make also sure that we have by then the new Audio Tracks used for those discs ready to choose in Profiler, so we can open those films from the beginning the right way. If I understand thing correctly, Ultra HD Blu-Ray is not a new format, but a new variant of the Blu-Ray technology, in a similar way that 3D Blu-Rays are. So there is no new media type needed, but the video format and audio format information has to be updated. On the other hand, if you buy a 3D Blu-Ray, it is always in some way possible to play back the movie on a 2D player. UHD BDs will only be useable on UHD players... hard to decide how this should be handeled. But the most important thing is that it should be integrated into DVDProfiler in some way in the next weeks. Definitely a new Media Type. The Blu-ray Disc Association, which is developing the format, calls it Ultra HD Blu-ray. I don't have a dog in this fight, but I don't think that matters. The DVD Association, which I believe is similar to the Blu-ray Disc Association, called their new format HD DVD. The logo was the normal DVD logo preceded by the addition of an HD logo. It was considered a new media type by invelos, so I don't see why this couldn't be considered a new media type as well. I hope Ken decides to add Ultra HD Blu-ray as new new media type. That post was hasty reaction to the unsupported declamation that is was "Definitely a new Media Type." Logo already posted 5 months ago. You understand correctly. 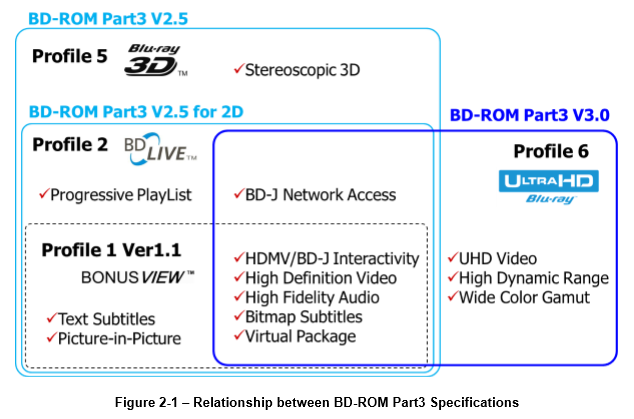 According to the latest audio visual application format specifications for BD-ROM white paper from the BDA, UltraHD is considered Profile 6 and is seen as a new extension to the existing Blu-ray format rather than a completely new format. Guess we'll have to wait and see how Ken ultimately incorporates changes for UltraHD BD. Since it requires a new UHD player, it seems to make sense that we should have a new media type to help people easily distinguish these from regular BDs. Do you see any question mark?